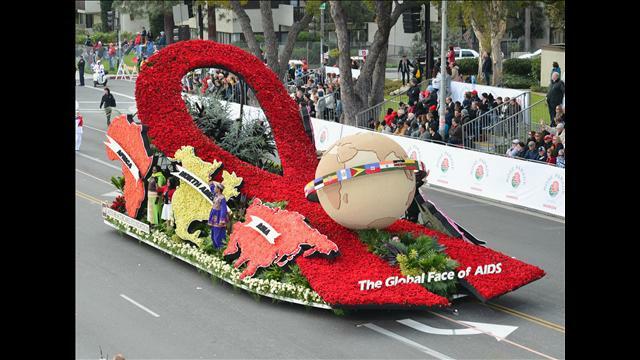 This past New Years day (January 1st) I had the honor of riding on AIDS Healthcare Foundation float: The Global Face of AIDS which was in The 124th Rose Parade. The Rose Parade, officially the Tournament of Roses Parade, is “America’s New Year Celebration” held in Pasadena, California, a festival of flower-covered floats, marching bands, equestrians. AHF’s parade first float entry was in the 123-year history of the Tournament parade and focus on HIV/AIDS and the first-ever sponsored by the 25-year-old global AIDS organization. AHF float honored two-time Academy Award-winning actress Elizabeth Taylor for her tireless, nearly three decade-long advocacy and compassion on behalf of people with HIV/AIDS. 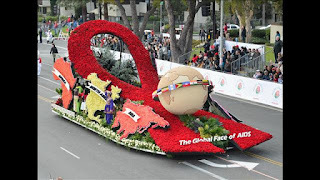 This year float: The Global Face of AIDS showcased the global impact the organization has had on preventing the spread of HIV/AIDS and providing access to care regardless of ability to pay. The float will featured five people riding on it who are not only living with HIV but are also actively involved in AHF’s fight against the disease by working directly with the nonprofit or receiving care from an AHF-supported clinic. Of those riders, four traveled from as far away as Africa and Russia to show that HIV is not a disease that is limited to a small fraction of people or one particular corner of the world, but rather affects people of any age, race, gender or orientation from all around the world. I was very honored to ask to take part and represent North America. With AFH entering a float to promote HIV/AIDS awareness I’ve been inspired to take awareness to new places.. During the trip I met a young girl named Marim from Uganda. Marim who is also living with AIDS was the highlight of the trip for me, even though Marim doesn’t speak English we were able to connect and bonded.